About Us | Mike Muth Scholarship Fund, Inc. 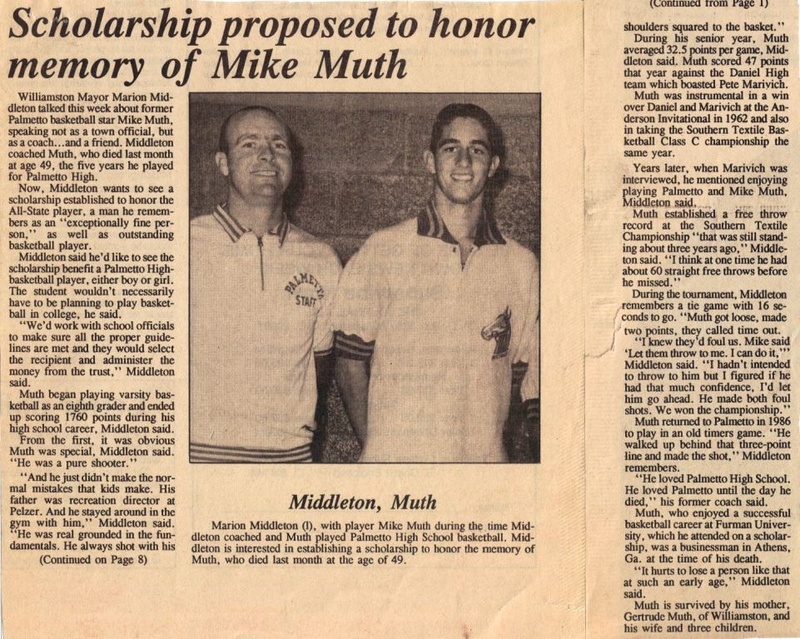 The Mike Muth Basketball Scholarship Fund, Inc. is a nonprofit organization established in 1995 by friends and family of Mike Muth after his death in 1994. Muth was a standout student-athlete at Palmetto High School (PHS), in Williamston, South Carolina and at Furman University in the 1960s. The Fund’s primary purpose is to provide financial support with college tuition to PHS students who participate in basketball activities and seek to further their education after high school graduation. Extra consideration is given to students with demonstrated financial need. If you are interested in applying for a scholarship, please review the information under the Requirements page. Except for ancillary expenses, all contributions to the scholarship fund are used to offset the costs of the recipient’s college tuition. The Mike Muth Basketball Scholarship Fund, Inc. 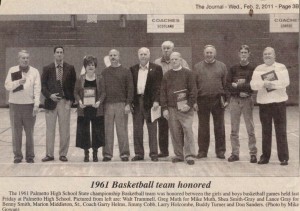 The Mike Muth Basketball Scholarship Fund (Fund) is administered by a volunteer board of directors. The Fund relies solely on individual donations to enable it to provide scholarships. 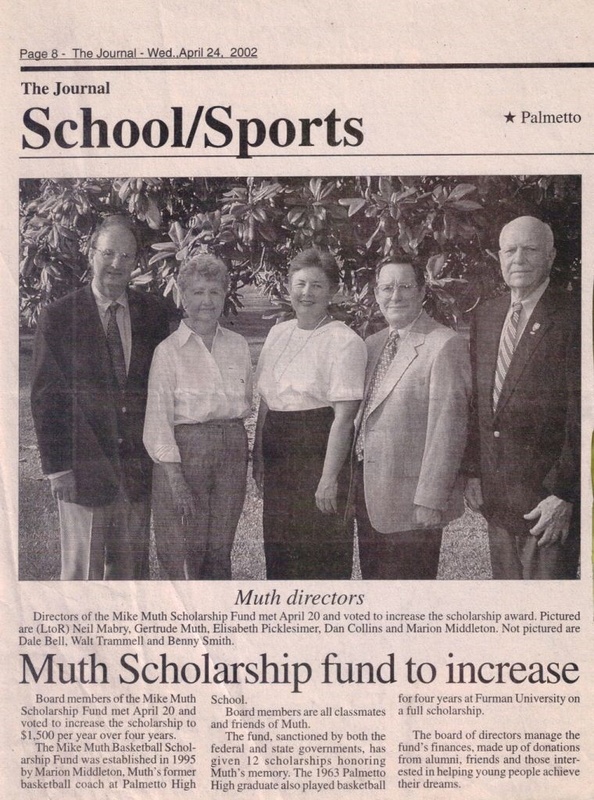 Since 1995 the Fund has received over $200,000 in donations from the community thus enabling it to provide 31 Palmetto High School graduates with scholarships as of 2015. 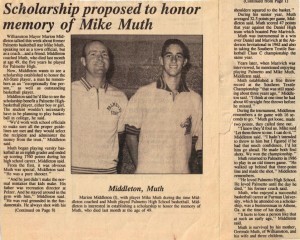 Mike Muth died in October of 1994. In November of that year Marion and Betty Middleton called Mike’s mom, Gertrude Muth, to say that with her permission they would like to establish a basketball scholarship fund in Mike’s memory. Mrs. Muth was humbled, surprised and delighted by their thoughtfulness. So the process of establishing the Fund began by setting it up as a 501(c)(3) entity under the federal tax code. Dan Collins, an attorney in Greenville and a former Palmetto High School classmate of Mike’s, volunteered to handle the required legalities. 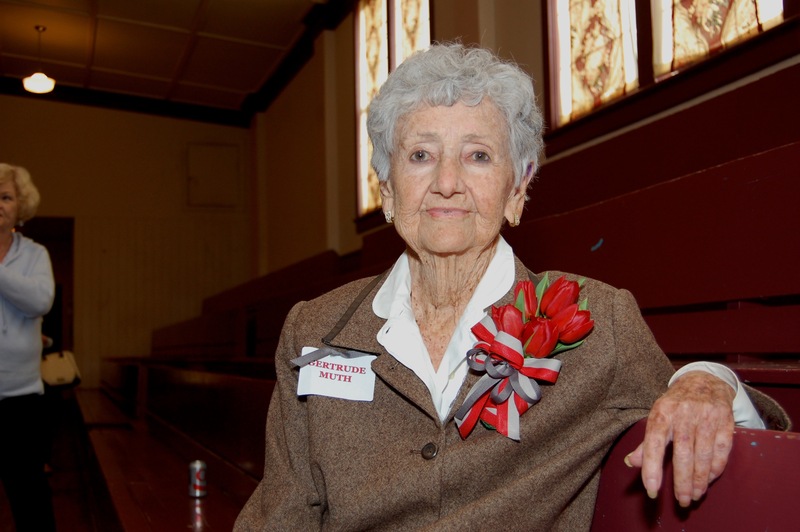 Elisabeth Pickelsimer, a long-time friend and former student of Mrs. Muth’s, lead the effort to develop the criteria to receive the scholarship. In addition to Marion, Dan, Elisabeth and Mrs. Muth, Dale Bell, Walter Trammell, Jr. and Benny Smith, also former Palmetto High School classmates of Mike’s, formed the first Board of Directors. Later Dickie McClelland, who has since passed away, was added to the Board. Marion Middleton has become Chair Emeritus. Today’s Board consists of Mike’s three sons, Michael (Chair), Richard (Vice Chair) and Greg, as well as Dale Bell (Co-Treasurer), Larry Holcombe (Co-Treasurer), Jerry Atkins, Chrishton Owens, Heather Jackson Thompson, and Jennifer Higgins Janssen who was recently elected to the Board. Chrishton was a 2013 Scholarship Recipient, Heather a 1997 Scholarship Recipient, and Jennifer was a 2001 Scholarship Recipient. The Board is so fortunate to have these three former recipients helping guide the Fund as it moves forward. The first $1,000 scholarship was awarded at the end of the 1994-1995 school year and was renewed annually provided the recipient maintained the appropriate grade point average at a post-secondary school. The award is now $2,000 and remains renewable annually. Of the 31 recipients who have earned the scholarship, 75 percent have successfully completed their post-secondary education.